Review: Jasmine lives in New York. She is deeply troubled and in denial. She goes to San Francisco to visit her sister Ginger. 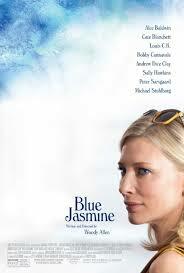 Cate Blanchett gives a wonderful performance. Without her the film wouldn’t be half as good. I am surprised that Sally Hawkins hasn’t been made more of. Well directed by Woody Allen. This is the third Woody Allen film that Alec Baldwin has been cast in. At the Academy Awards in 2014 this won one Oscar and that was for Best Performance by an Actress in a Leading Role (Cate Blanchett). At the Golden Globes in 2014 Cate Blanchett won Best Performance by an Actress in a Motion Picture – Drama. At the Bafta Awards again the same year Cate Blanchett won Best Leading Actress. One film critic wrote ‘While the film may hold some viewers at arm’s length, the performances are worthy of stand-up-and-cheer ovations all round’.